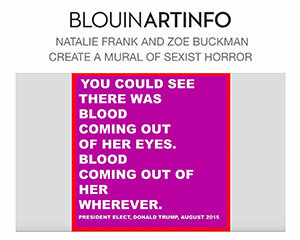 Blouin Artinfo‘s Rachel Corbett interviews artists Zoë Buckman and Natalie Frank about their upcoming mural project in collaboration with NY Live Arts. The artwork, titled We Hold These Truths to be Self-Evident, is a large scale mural that will combine imagery of the female figure along with negative, sexist statements politicians have made about women. Donate to the project now on Kickstarter.